Okidoke, so A LOT has happen since my last blog, but the biggest news is I got a JOB! I now work at Sunken Media LLC and at the moment I wear many hats(various jobs) but I make general art assets. The company is new but growing fast and strong! I really excited and will be busy for a while, as I have been for the last two weeks. So being quite busy lately has pushed back some personal projects, but I had some time to finish my Tarot piece... very last minute =P I actually finished, printed, framed and delivered my "Two of Swords" piece Friday the night before the show The Hive Tarot Themed Show. I was also to busy to attend the show, but I wish I could've because it sounded like it was going to be great! Will attend before it's over Oct 31st! Before I started this piece, I thought about the swords. I told myself I wanted to make them look beautiful, but claymores(to me) are so boring and ugly. The straightness of the claymores ruins the composition, shooting the eye flow out the piece. So I thought to use the sword I loved the most, which were Arabian swords(Also Pirate swords), otherwise, Scimitars. From there I followed down theme with a Arabian Nights storybook look. 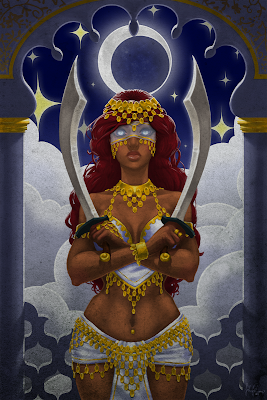 I always wanted to make a Persian/Arabian themed piece so I was very excited. I chose a belly dancer mainly for the detail in their jewelry and their gorgeous figure. I ended up finding out that belly dancers actually have a dance which they move with the scimitars, one balanced on their head and one which they swung around lovely. I could've made this piece more dynamic, like in pose and background, but I always make pieces like that so I mimicked the classic tarot card look were they seem a bit rigid and strong. While designing the piece I noticed she would have to be blindfolded, but I don't like removing eyes off my pieces because I feel the eyes connect people to the artwork. So I made her blind, with a sheer blindfold to continue the effect. The Two of Swords was about decision making, and I felt this was a true test of my ability to choose what was right. Sorry for the long description, hope you all like! Oh and I have another show coming up, a Halloween Themed show with GirlsDrawinGirls, but will update later! !